I am not a temple goer. I find the energy and fervour and the attendant din of a crowded temple distracting. Rare visits on special occasions are more nostalgic concessions to tradition, rather than opportunities for communion with God. But the vibe at each of the three temples that constitute the UNESCO inscribed ‘Great Living Chola Temple‘ ensemble was different. And visiting these sublime monuments during Shivarathri – the most important Saivite festival celebrating the birth of Shiva – elevated the experience to another level. Also referred to as Periya Koil (Big Temple in Tamil), this is the most magnificent of the three, perhaps of all temples in India. It was consecrated in 1010 AD by Raja Raja Chola I, to commemorate his extraordinary military exploits. And possibly funded by war booty from Lanka. Its scale and grandeur, and its name – then RajaRajeswara (Eswara = Shiva) – proclaim the power and the divine status of the victorious emperor. This is also the oldest among the greater Dravidian temples, and the most refined. It is encompassed by a colonnaded perimeter wall and approached through two monumental gateways across the now dry moat. The dominant feature of the principle shrine within the complex is its spectacular 63 mtr high vimanam (tower). It is topped by a cupola comprising two huge sculpted granite blocks that indicate engineering prowess far ahead of the time. The pyramidical tower is reinforced on the inside by a secondary vertical support, both resting ingeniously on a pair of concentric walls around the sanctum housing a gigantic lingam (the phallic representation of Shiva). Fine frescoes – Maratha era as well as recently discovered and restored finer Chola paintings beneath – cover the surfaces of the two storey high cicumambulatory corridor formed by the parallel support walls. Entry to this space is now restricted in order to preserve the decaying artwork. The enormous monolithic Nandi (Shiva’s bull mount) in a smaller shrine opposite, is a later replica. The slightly smaller and more beautiful original, sits forlornly in a corner of the peripheral wall to the left. I visited the Big Temple twice; on the evening on the day of my arrival in Thanjavur , and on the morning after Shivratri on the day of departure. And it was thrilling to be able to witness and participate in traditions that have been in practice without break for over a thousand years. Rajendra Chola I, who had assisted his father in his military campaigns, nursed grander imperialist ambitions. He quelled rebellions by the Sinhalese in the south and the Chalukyas to the west, and then marched northwards vanquishing the Kalinga, Vali, Odda and the Pala kingdoms along his way to the Gangetic plains. He went on to extend the Chola empire all the way to Burma, parts of present day Indonesia, Malaysia, Thailand, Cambodia and Singapore, significantly influencing the culture and commerce of the region. His conquest of the Gangetic plains merited a brand new capital, grandiosely named Gangaikonda Cholapuram (City of the Chola who brought Ganga home), and a temple that almost rivalled that of his great father. Some believe that the temple, completed in 1035AD, was deliberately conceived as a smaller, feminine complement to the great temple of Thanjavur out of filial respect. The sculptural detailing is far more elaborate, however, and the 4m tall iconic lingam occupying the sanctum, the largest in Tamilnadu. The Nandi, made of stucco unlike the monolithic solid stone sculptures of the other Shiva temples, is designed to reflect sunlight directly into the sanctum. The entrance gate is missing its gopuram (gate tower), its stones appropriated during the British Raj for the construction of a dam. A huge reservoir nearby – the Chola Gangam – signified a ‘liquid pillar of victory’. According to one story, every king defeated in battle by the Cholas was ordered to symbolically empty a pot of sacred Ganga water into it on the grand event of its consecration. The once glorious capital is today reduced to a dusty village, incongruously named Jayakondan (he who gained victory), surrounded by the barely discernible ruins of a palace. The Brihadeeswarar temple remains the sole purveyor of the stories and the forgotten legacy of the Master of the Ganga. Darasuram is a corruption of Raja Raja Puram, the name of yet another Chola capital set up by the 12th century monarch, Raja Raja Chola II, in the existing temple town of Palaiyarai. Its presiding deity – Airavatesvara (protector of Airavata) – gets his name from a legend in which the pristine white elephant of the king of the Gods (Indra) prays to Shiva at this site seeking redemption from a curse that changed his colour. While relatively smaller in size, with just a 24 m high vimanam, this stunning temple is standing testament to the excellence and refinement of Chola art. A mahadwara (great entrance) leads to a sunken courtyard with the Nandi shrine, whose stone steps are said to produce musical notes. 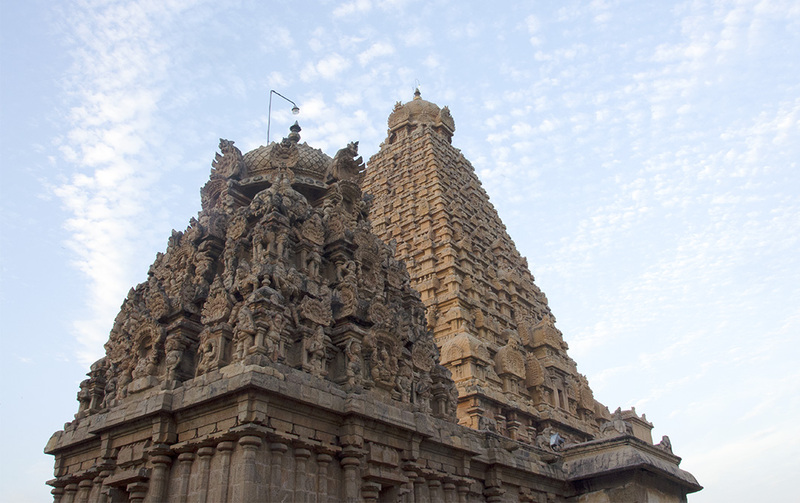 The temple is accessed through a second royal gate with a restored gopuram. Several mandapams (pillared halls) precede the main sanctum with a beautiful silver embellished lingam. The southern side of the mandapam, is in the shape of a chariot led by elephants and horses. The detailing is exquisite. Seated mythical yali figures form column bases. The plinth is adorned with a series of friezes depicting legends and scenes from daily life including a (standing) childbirth scene. A 73 panel depiction of the lives of Nayanars – the 63 Saivite saints whose teachings were compiled by the great Raja Raja I, into a twelve volume compendium of hymns called Tirumurai – is considered one of a kind. I wished I had more time to study these sculptures in detail. But I was equally impatient to return to Tanjavur to hunt down some long forgotten historical relics. Disclaimer: My visit was made possible by Svatma Thanjavur. Darasuram is about an hour by road from Thanjavur (35.7 km) just short of Kumbakonam. Best combined with the temple town. Gangaikonda Cholapuram is roughly two hours from Thanjavur (72 km) in the same direction, and although both are easily done in a single trip, it is advisable to spread it over two visits if you want to linger in each. Most fascinating, informative post, Madhu. Some stunning images! Thank you Sue. It was long, long overdue! Great to see your posts. Thanks for this tour, a very interesting one! Glad you enjoyed it, thank you very much for reading Stephen. Nice to read about your visit, thanks for the tour. So good to have you back, Madhu. I hope things have gone well with you in the interim. I’m continually amazed at the detail on these temples! We had some very scary moments but yes, much better now, thank you Janet. Happy to be back here myself. This post brings back some good memories, Madhu. Due to our short stay in the city, we decided to book a hotel which was within walking distance from the temple. As we approached the temple compound, I remember how impressed I was upon seeing the tall vimanam from the street. Inside the walls, it was even more impressive and magnificent. However, somehow I didn’t see the original Nandi! Visiting Brihadeeswarar temple was among the most memorable moments for me during our one-month trip in India, partly because as a kid I often read about the Chola Empire in school textbooks. Hopefully one day I can return and visit the other temples in Gangaikonda Cholapuram and Darasuram — when the latter is not flooded. Haha, I was thinking of you when I stepped into that courtyard in Darasuram 🙂 The level is considerably lower and I have no doubt the drains are never checked. Pity you and James went that far and couldn’t enter, but I would have done the same in your place. You need to return in Feb/March for cooler, drier weather. Would keep that in mind the next time I go to Tamil Nadu! Oh my goodness, I have to go right now and look most of these places up on a map! The temples and their histories, with all the strange names and vocabularies, make for an exotic post to this neophyte in Indian history. And I am so much more likely to read and learn from someone like you, a “regular” person who writes so clearly and well in digestible doses. Thank you! Ha, hope it made some sense 🙂 The stories would be hard to comprehend if you do not have a basic knowledge of at least the principal Gods in our pantheon. We have varying interpretations to boot and even pronounce the names differently in the North and South! But the symbolism inherent in the legends is endlessly fascinating. Thank you for reading Lex. What an amazing place Madhu. And wonderful photos. Thank you Alison. The fact that prayer rituals in these temples have continued uninterrupted makes them all the more remarkable. Lovely post, Madhu! I am going to Tanjavur later this year and have bookmarked your post. You are in for a treat Aruna. Hope you’ll have time for the Ranganathaswamy temple in Trichy as well. I regret having missed it. I really enjoyed seeing the temples in Cambodia when I was there. I’d love to go to India sometime and see some of them there. You should David. These kings and their temples probably influenced Khmer Hindu architecture to a great extent. Be sure to let me know if you do decide to come down South. There are so many architectural wonders in India. Of course the Taj is the classic winner, but there are other places in Bharat Mata that have amazed me too. The detail in the Madurai complex still stands out in my mind. beautiful ! i remember the temple in Tanjavor with all the people around and inside, it is one of the best i visited in Tamil Nadu. So much feelings. I agree. One of my favourite temple experiences to date too. Thank you for reading Annie. Have a great day! So a beautiful trip ! These craftsmanship is really superb. I guess the present generation can only admire it. And we might have anyone like this doing on that scale. True. And we are fast losing much of our traditional skills. Fast losing I would say lost. Have to agree. It was the whole experience and not just the architecture that I found appealing. Thank you for taking the time to read and comment Ami. Thank you for your lovely comment. Tanjavur is a must visit for anyone interested in Tamil history and culture. Hope you get to go soon. Try and time your visit with a dance or music festival if you can. Doesn’t it feel like a sinful confession of sorts: “I am not a temple goer.” I’m not, either, but always feel guilty for not feeling the reverence of a place. I do still find them impressive, and I love to watch the people who are there worshipping. These temples look amazing! Glad you enjoyed the experience. Oh yes it does! And in the prevailing atmosphere in this country, comes close to inviting blasphemy charges 😀 But like you I find ancient religious places – of all faiths – hugely fascinating. You should plan a visit to India Juliann. Madhu, you ought to start writing history books, especially for Indian schools. That was more interesting than any history lesson I’ve learned. To think I hated history in school! Travelling truly brings all those boring lessons alive. Might not be a bad idea to hire travel bloggers to illustrate history for younger students 🙂 Thank you very much for stopping by Ashu. Awesome Clicks and a very nice post to read. Thank you very much for reading Gopesh. Fascinating write up, Madhu ; And of course, great visual journey – thanks to the photos and your writing style too. I’ve not visiting Tanjavur yet – but definitely worth a trip to take in both the heritage and the sights. Appreciate your kind words Sid. Yes, Tanjavur is definitely worth the effort. This visit has inspired me to explore more Tamil temple towns. I am yet to visit Kanchipuram which is barely an hour away! Hello, Madhu, so very nice to see you and to read your thoughts (and facts) on Tanjavur. Knowing that a site has been designated UNESCO sometimes makes it more enticing, and therefore more meaningful. Your photographs were wonderful. Hope you are well! Belated thanks Anindya. Great to be back. Such lovely architecture. I loved the sculptures in Brihadiswarar temple at Gangaikondacholapuram. Another temple I love in the south is the Durga temple at Aihole. Been there Madhu ? Some beautiful shots here.. like this one “Roof of Nandi shrine with Maratha paintings – Brihadeeswarar Temple, Tanjavur”! I’ve missed you Madhu, hope all is well 🙂 This is yet another fabulous piece of travel writing, so informative and tempting as well. What a lovely place to stay, a perfect trip! what a coincidence, I am also not a temple-goer, but I love reading articles on it.and that why I end up my research on this article. And trust me this is a true craftsmanship. Love your work. Thank you very much for your lovely comment Ankur. 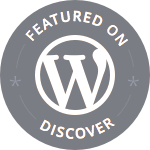 And for featuring my blog in your list. Much appreciated.